Healthy Bones, Nerve and Muscle Function and more! 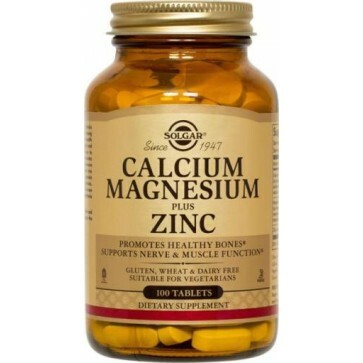 Solgar Calcium Magnesium plus Zinc promotes healthy bones and nerve and muscle function. Gluten, wheat, dairy, soy, yeast, and sugar free. Ingredients in 3 tabs: 1000 mg calcium carbonate, gluconate, citrate, 400 Magnesium oxide, citrate, and gluconate, 15 mg zinc gluconate. To support absorption take with Aloe Life WL Juice concentrate or Tablets.